Beer is delicious. The brewed beverage has been part of human life for at least 5,000 years. In fact many historians believe that the cultivation of grains and subsequent development of beer and bread led to something we all like better than craft beer: civilization. When consumed in moderation, beer provides a relaxing, tasty and filling diversion from the stresses of everyday life. In the heat of summertime, ice-cold ale goes a long way; in winter, a frothy stout served at room temperature can give one energy and nutrition. Being a beer lover in America has never been better. The modern American beer drinker has many choices when he decides to purchase beer these days. There are more beer options in the liquor store and in taprooms today than at any point in history, and the options are on pace to continue growing. The main driver behind the growing number of beers is the increasing number of craft breweries. Peaks and Pints presents a flight of American craft breweries that changed the landscape of beer not just stateside, but abroad too. Not only do these breweries brew flavorful beer, but also had a profound impact in how people produce beer, purchase beer, drink beer, and think about beer. Nestle up to Craft Beer Crosscut 3.28.19: A Flight From Five Breweries That Changed History. The great-grandson of a home appliances magnate and the son of an Iowa dairy farmer, Fritz Maytag was intrigued upon hearing the 69-year-old Anchor Brewing Company was facing closure and thus up for sale in 1965. He purchased it for just a few thousand bucks. Anchor Brewing was perhaps the most primitive small craft brewery in the world, but by 1971 — the year it began bottling Anchor Steam beer — the San Francisco brewery kicked off the craft beer movement. 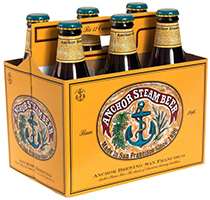 Anchor Steam Beer derives its unusual name from the 19th century when “steam” was a nickname for beer brewed on the West Coast under primitive conditions and without ice. While the origin of the name remains shrouded in mystery, it likely relates to the original practice of fermenting the beer on San Francisco’s rooftops in a cool climate. In lieu of ice, the foggy night air naturally cooled the fermenting beer, creating steam off the warm open pans. Northern Brewery hops are enjoyable in the flavor, but the rich, almost chewy malt is the best aspect of this brew. It’s complex, rich flavor, deep amber color, and its thick, creamy head make it an instant classic. The craft beer movement has always been about the sense of adventure, going back to that little warehouse in south Chico where Ken Grossman and Paul Camusi brewed their first batches of Sierra Nevada Brewing Pale Ale way back in 1980 (to put that in context, that was the year The Empire Strikes Back hit theaters, and Lipps Inc.’s “Funkytown” was one of the biggest singles in the world), paving the way for the rest. Sierra Nevada taught the world to love hops. Craft beer has come a long way since then, and Sierra’s Pale Ale is still the pale ale to which all other pales are judged. Sierra Nevada Otra Vez gose, on the other hand, took more than 100 iterations before deciding on the final formula, and it took a “beautiful accident” for the brewers to get it just right. The brewers tried dozens of different strains of lactobacillus bacteria before they stumbled on a novel strain that had accidentally infected a yeast sample. Otra Vez Gose combines the classic flavors of lime and blue agave nectar in a tart gose-style beer where the mild sweetness of the agave rounds out the tangy zip of the citrus fruit. Sam Calagione started making beer in 1995 when he opened Dogfish Head Brewings & Eats in the beach community of Rehoboth Beach, Delaware. It was the smallest commercial brewery in America at that time. Within a few successful years, the company activated a major expansion, switching from making very small, homebrew-style batches to industrial-sized sessions in a sizeable brew house. Dogfish Head Craft Brewed Ales expanded and moved to a 100,000 square foot facility in nearby Milton, Delaware in 2002. They’re one of the largest craft brewers in America but yet there may be no brewery today that exhibits such a dedication to experimentation and boundary pushing. 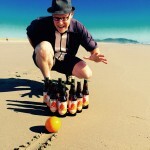 Right from the get go, Calagione’s brewery produced beers utilizing apricots and peaches, algae, Ethiopian honey, grapes and berries, herbs and spices, and even boiled lobsters. 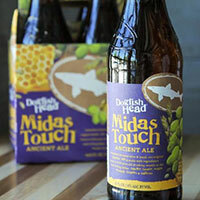 Midas Touch is the first beer in the brewery’s Ancient Ales series. It’s a concoction of beer meets mead brewed with barley, white Muscat grapes, honey and saffron. This smooth, dry ale will please with Chardonnay or IPA drinker alike. Hair of The Dog Brewing is proud to be one of the first breweries in America specializing in the production of high alcohol, bottle conditioned beers as well as experimenting with the barrel aging process since 1994. Founder Alan Sprints has180 oak barrels used to age his beer from 6 months to 8 years. Inspired by the historical style Adambier from Germany, Adam is a strong, dark smoky ale aged for an extended time in barrels for deeply bready malt flavors layered with roast, smoke, and leather. It’s astonishingly complex and punishingly strong at 10-percent alcohol. Goose Island Beer Co. was a humble brewpub born in 1988 in Chicago’s Lincoln Park neighborhood when, in 1992, brewer Greg Hall decided to age an imperial stout in used Jim Beam barrels. That simple act, and the resulting beer, Bourbon County Brand Stout, would change the higher-end potential of the industry. Made from two-row and malted wheat, Bourbon County Brand Wheatwine made its debut in November 2018. As the first recipe to veer from the original imperial stout since Bourbon County Brand Barleywine in 2013, Wheatwine is a deep amber color, lighter than its Bourbon County Brand Stout counterparts and a true medium to convey the characteristics of 4-plus year old Heaven Hill Bourbon barrels. Wheatwine is full of high caramel, vanilla, butterscotch and toffee flavors.